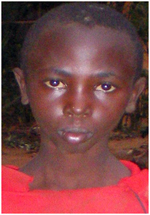 Daniel’s story is typical of many orphans and vulnerable children in Rwanda. When he was two years old, his father died of HIV/AIDS. His mother also has HIV. Without a male role model and fatherly presence in the family, Daniel began to develop behavioral problems as he got older. By the time Daniel was in the fourth grade, he was skipping school and spending time on the streets. Eventually, he simply dropped out. Daniel’s lifestyle was putting him at risk to become a violent youth, possibly a drug abuser, and a detriment to society. However, when YEGO Rwanda founder Rev. Emmanuel Gatera came in contact with Daniel, he provided him with counselling. Over time, he persuaded Daniel to return to school and gave him the financial assistance necessary to do so. Today, Daniel is twelve years old. He is successfully passing his fifth-grade classes and is slowly developing into a mature young man. While Daniel’s story is not yet finished, YEGO hopes that through its continued help, he will become a good son, successful student, and, one day, a loving husband and father. Daniel is part of YEGO’s larger vision to enable young orphans and vulnerable children to avoid lives of crime and empower them to become active, productive members of society. To help Daniel and other children like him, please consider helping YEGO Rwanda today.